We all experience uncomfortable emotions that challenge us. At these moments it is important to have the tools to skillfully transform and work with our emotional content. Acknowledging, valuing and letting be with whatever we are experiencing can be a powerful tool for overcoming mental and emotional habits that cause us unnecessary suffering. Please join us for an evening of discussion and meditation on letting be. Tenzin Namsel is an American Buddhist monk in the Tibetan Buddhist tradition. 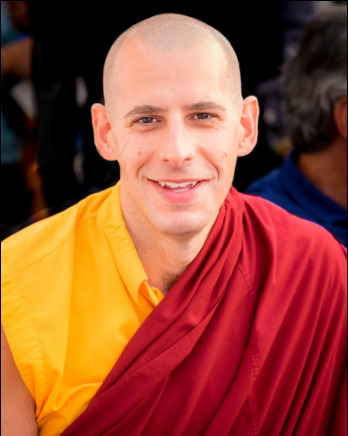 He took his monastic ordination with His Holiness the Dalai Lama in 2008 and has developed his Buddhist studies and practice under an array of well-respected Tibetan Buddhist masters and in a variety of solitary meditation retreats since his early twenties. Namsel teaches meditation and Buddhist philosophy throughout the United States. He also supports Tsoknyi Rinpoche's Pundarika Sangha as a practice advisor and leads review sessions during teaching retreats with Tsoknyi Rinpoche.